It's me is a program for quick and easy access to your PC. With It's me you minimize your time for logging in. What's New: Automatic launching of the program after turning on your PC. 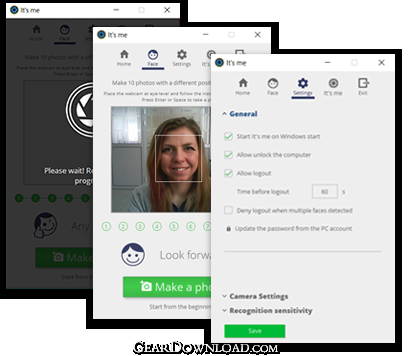 Single user account with the ability to log in to any PC. The program compatible with any 2D camera. Precise setting system of recognition for any user. This download (It's_me_Install_EN.exe) was tested thoroughly and was found 100% clean. Click "Report Spyware" link on the top if you found this software contains any form of malware, including but not limited to: spyware, viruses, trojans and backdoors.